CrossFit coaches talk… a lot. While our job involves wearing a bunch of different hats (greeter, comedian, programmer, observer, referee, and on and on), but the thing that weaves all of those together is language. We talk from the moment class starts pretty much until it ends, so it’s useful to consider how our language (and the language we hear from our athletes) is best deployed and when it is and isn’t appropriate. Using clear commands will actually make people’s movements mimic your tone- they will lift faster and crisper if you are being fast and crisp with your language. If you are slow and languid expect the same from your athletes! There is such a thing as talking too much (it pains me to say it, but ‘tis true). It’s important to know when to stow it and let your athletes do work without the potential confusion of a word salad landing on their heads. This was best driven home to me during a seminar I took where if you cued an athlete with anything more than one or two words you’d get chastised. The coach at the seminar does a good job of highlighting the difference between coaching and cueing. Coaching is what goes on between sets, during down time, or before or after class. During that coaching time you impart your cues- quick verbal reminders or what you want the athlete to do. During a lift or metcon you should be able to just say a word or two- “HEELS!”- that gets your athlete moving better. If when you say “heels” your athlete thinks you are talking about Louboutins, you didn’t coach them enough. If you tap your athlete on the shoulder and say “Hey Jimbo, I need you to shift your weight back a little bit so it’s more in your heels. You should be able to wiggle your toes… that will let you sit your hips back more and then you will be able to squat to depth easier” while they are in the middle of 10 front squats of a metcon, they will want to kill you… aaaaaand you probably deserve it. Finally, words have power, so be careful about how you speak and the language you allow in your classes. Obviously you shouldn’t be saying things that make people feel uncomfortable in class- I generally stay far away from anything that’s potentially sexually suggestive, bordering on race/religion/politics, etc. Even if I have some insightful piece of commentary that the world needs to hear, it’s neither the time nor the place, and just not worth the risk. On top of that, be cognizant of little verbal throwaways that might be simple everyday sayings, but can possibly make people feel bad. One good example (that I still mess up on sometimes) is when working with an athlete about scaling options, eliminating the use of “just”. If the workout calls for toes-to-bars and you tell someone to “just do knee raises” or “just do sit-ups”, you are very subtly saying that those movements are inferior. It’s likely not a big thing, and the athlete may not even realize it, but why risk making someone feel crappy? I also tend to police my athletes for the same thing- it’s easy for someone to say something offhand that another person in class will take as a dig at them. My favorite example is when Frank Firebreather says “Oh, I’m gonna go light on my squats today, I think I’ll just work at 405 or so.” People do this because they think people are judging them (everyone knows Frank squats 450 for reps bruh) but it’s unnecessary, and now the new guys whose PR is 150 feels like a hopeless weakling. I’ll usually just quietly take Frank aside and say “Hey man, you can just tell me your numbers, no need for editorial comment” and explain how that might make other people feel. 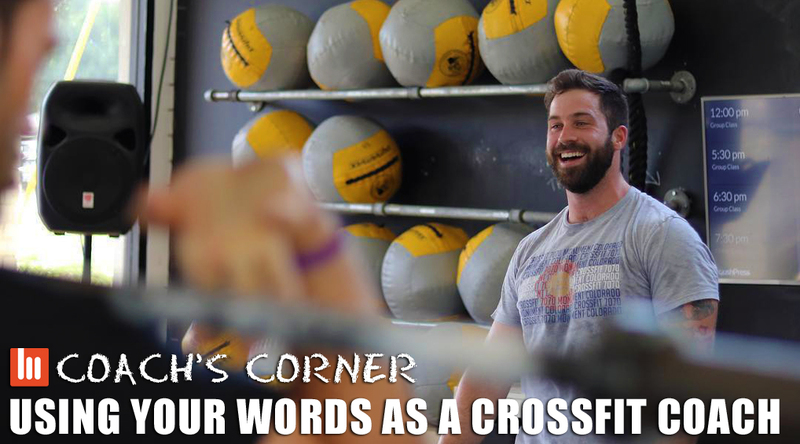 In my experience, CrossFitters are nice people, so everyone who I’ve ever done this with has immediately “got it” and quickly been more thoughtful about their language. That can also extend to watching and coaching the ways people talk about themselves, their workouts, etc. Negative language can frame an otherwise solid day of work as a failure, so I make sure that people are mindful of the positive and express it, especially when I can tell they are beating themselves up about something. Injury has a large psychological dimension to it, so alarm bells go off for me when someone says “Well, I’m just broken” or something like that, and I do my best to help the person re-frame things and reassess the words they use to describe what they are feeling. In sum, think before you speak! Set the tone for your classes, use your words, volume, and distinction to elicit the response you seek, and keep in mind that little “throwaway” words and phrases can have great impact. Now get out there and share that (hopefully refined) gift of gab!